You will be shown a configuration dialog the first time you run the program. You will only be shown available COM ports. 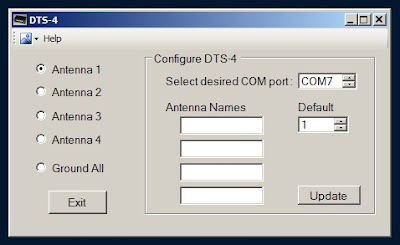 Be sure to select the COM port to which the DTS-4 is connected. You can name the antennas in the text boxes provided. Select the antenna number you want to be the default antenna. This antenna will be selected each time you run DTS-4. Once running, change antennas by selecting the new antenna desired. 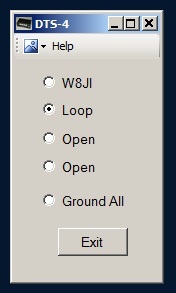 All the antennas can be grounded by selecting "Ground All". Once configured you will see a much reduced window each time you run DTS-4. You can later change the setup by clicking on the pull-down next to Help and selecting Configure DTS-4. All of your selections are saved in the System Registry. To remove these entries, click on Help and Uninstall. Direct any questions or comments to W4UOA. My email is good on QRZ.